A rootstock is a plant with roots, on to which a plant of another variety is grafted. What can we graft/bud on to what? 1. Some pears can be grafted or budded on to pear, quince or hawthorn rootstocks. Bartlett (Williams) pears are incompatible with quince but can be grafted on with a compatible intergraft. Pears on a quince rootstock produce a considerably smaller tree that fruits a few years earlier but only lives perhaps 20-30 years. This may suit the home gardener. Quince rootstocks can be raised from cutting. 2 Peaches and nectarines can be budded or grafted onto peach, nectarine or cherry plum rootstocks. Nectarine seedlings that have sprung up in the garden should be OK.
3. Grow direct from cutting - Figs, grapes. The range of apple rootstocks available allow people doing their own grafting to plan their orchards for the best returns from the available space. The dwarfing rootstocks have weaker root systems so may need staking. 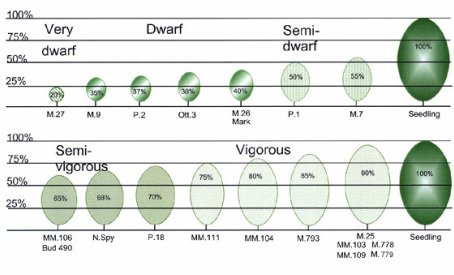 All stocks of the Malling series (M) are not resistant to Woolly Aphid, except M26 which has some resistance. Stocks on the MM series may have some resistance to Woolly Aphis. Soil fertility can influence the eventual size of the tree as can vigor of the scion. M7 3-4m Medium mod-hardy no yes S VS ? Some resistance to water logging. N' Spy 3-4m Medium Very hardy yes yes VR VR no Good drought resistance. MM111 4-5m Medium hardy yes yes R VR no Suitable for light soils. The problem of needing to stake drafting rootstocks and some other problems of these rootstocks can be avoided to a degree by intergrafts of a piece of dwarfing stock on a normal rootstock that has the desired characteristics. Information in "Rodales Organic Gardening" Sept '85 is included to give an idea of what can be done and encourage local experiments with combinations such as Northen Spy with M9 intergrafts. ADVICE ON SPACING- Spacing of apples varies with rootstock and the above table should prove very helpful. It is suggested that the distance between trees be the maximum height on the above table. Eg- two apples on M27 rootstocks should be about 1.5m apart and two apples on Northern Spy should be about 4m apart. A selection of excellent quality apple rootstocks raised from root cuttings as well as cherry rootstocks raised from root cuttings. Apple, pear, plum, mulberry and cherry rootstocks, seedlings of chestnuts, walnuts (both eating and black), hazelnuts, honey locusts and an excellent selection of ornamental and useful trees. Pear, apple and other fruit rootstocks as well as a selection of useful and ornamental trees. Write or phone for information on their selection of rootstocks. sprinkler system is ideal to keep it moist at all times but this would not be necessary if someone was prepared to keep it watered regularly. August is the month to plant seed, root cuttings or stem cuttings for deciduous fruit trees. APPLES- These can be raised from seed or root cutting. Seed taken from a fully ripe apple (tell by the dark brown colour of the seed) and must be kept moist and stored in the fridge. Some varieties of apple are better than others and it may be worth trialing locally adapted seedlings, such as the ones growing on the side of the road. Take root cuttings from select seedling apple rootstocks or from the commercial varieties of rootstock that you want. Sections of root in excess of 5mm thick and about 12-15mm long are poked into the propagation bed so that the tip just remains above the surface. Space them about 200mm apart. Some of the dwarfing rootstocks (M27, M9) may take two years to grow to size. Take root cuttings each winter from the rootstocks that you grow. PEARS- Best grown from root cuttings the same as apples. If growing from seed either buy Calleryana D6 seed or other seed recommended for rootstocks and plant 150mm apart. CHERRIES- Grow from root cuttings the same as apples and pears. Seed can be bought also. rootstock that you raise. Cuttings about the length and thickness of a pencil are ideal. Take cuttings when dormant and poke then into the propagation medium. Space them about 200mm apart for single stem rootstocks the following winter. Plant them about 250mm apart for budding the following autumn, or to cut the tip off in early January for a rootstock suitable for multi-grafting the following winter. QUINCES- Cuttings the length and thickness of a pencil can be poked in to the propagation bed. Quince C and Quince A cuttings are fairly easy to strike, Quince BAC 29 are very hard to strike and it has been suggested that these may have to be raised in a "Stool bed"
(a) Crack and remove shell, soak kernels 24 hours, dust with a fungicide and store in a fridge in moist vermiculite, in an airtight plastic bag, for 8-10 weeks (b) Crack, but don't remove shell, soak 48 hours, dust with fungicide and store as above. (c) Soak 3-4 days without cracking shell and store in damp sawdust, in an airtight plastic bag, in fridge for 8-10 weeks. Towards the end of the recommended time in the fridge watch seeds for signs of germination. When there are signs of germination the seeds can be planted. Seeds can be planted in the vegie garden for a year. In mid spring when the cuttings have started to grow they can be fertilized with "Seagold", a bit of dynamic lifter and a good seed free compost. Mid summer the rootstocks should be ready to bud if it desired. Or they could be left to the winter for rootstocks for grafting. CITRUS- It may be best to start seeds in large pots, the size depending on what size seedlings it is intended to produce. Potted seedlings can be transplanted out and later budded or perhaps cleft grafted. Budding or grafting is probably best done in spring. Most citrus can be budded onto most other members of the genus and onto some related genus such as Poncirus (trifoliate orange) and Fortunella (kumquat). However choice of rootstocks is very important and this is a great opportunity for "collective learning"
Sweet orange (Citrus sinensis) seedlings are suitable for all citrus, producing large vigorous trees that produce good size, thin skinned fruit of good flavour. They are suited to light to medium well drained soils. Sour orange (C. aurantium) seedlings suit most citrus species, have a vigorous deep root system and produce high quality, thin skinned juicy fruit. Rough lemon (C.limon) seedlings are suited to sandy soils and it has an extensive root system. Trees on this rootstock out produce trees on other rootstocks, however the fruit is considered inferior. Fruit is thicker skinned and less sweet and the tree is less cold hardy on these rootstocks. Some orange cultivars on Rough Lemon develop an incompatible bud union. Possibly unsuitable for mandarins. Trifoliate orange (Poncirus trifoliata) seedlings are commonly used in S.E. Australia. It has a dwarfing effect, producing a smaller mature tree than those on other stocks. Not well suited to heavy clay soils or on sandy soils. Hartmann and Kester say "On light sandy soils its growth may be so poor that trees on this stock are worthless." Though deciduous, trees worked on this rootstock are more cold hardy than trees worked on other stocks. Trees on this stock are susceptible to lime induced chlorosis. Citranges (Trifoliate orange X sweet orange hybrids) Troyer- vigorous, cold hardy, resistant to gummosis and produces high quality fruit. Cleopatra Mandarin (C. Retriculata) Some tolerance to salt and produces high quality fruit of a slightly smaller than average size. Chief disadvantage is slow growth of seedlings and is incompatible with some varieties, particularly Eureka Lemon. Sweet Orange (C. sinensis) Suits all citrus cultivars, producing a large vigorous tree. Good for well drained soils but cannot handle water logging. Rangpur lime (C. aurantifolia X C. Retriculata) The most salt tolerant rootstock used in Texas. Plum cuttings- Buck, English Marianna, Marianna 2624, Marianna GF8-1, Marianna PSI-A, Myrobalan Brown Tip, Myrobalan H29C, Myrobalan PR2. 15 Bowen Cresent, West Gosford, NSW 2250 045 250 247. Cuttings of quince A, C and BAC29. All orders to be in by April each year and supply is usually in June. We thank Jim Rochford for making the information available to us and are happy to recommend Rochford Rootstocks as friendly suppliers of a quality product. They also supply cherry rootstocks (Mazzard F12-1) and pear rootstocks (Calleryana D6) which should be compatible with all pear varieties. References- 1. Plant Propagation: Principles and Practices. Hartman and Kester. 2. Forgotten.